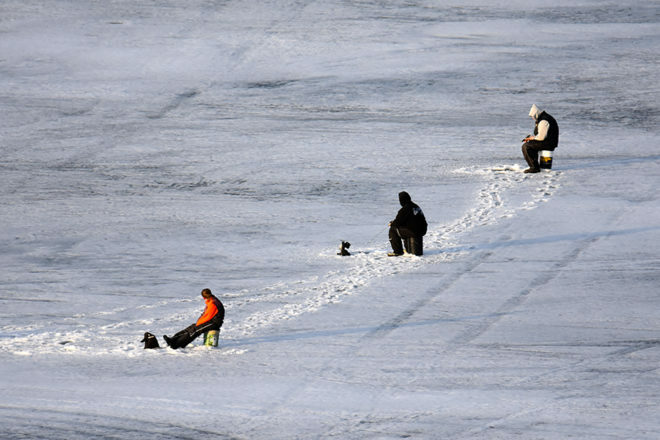 Fishermen seeking some of winter’s last catches on Sawyer Harbor in Sturgeon Bay March 29. Photo by Tim Sweet. With continued cold nights in the 10-day forecast, Green Bay’s ice isn’t going anywhere soon. In fact, unless things heat up significantly in the coming weeks, boaters on the bay side may still be dodging ice floes during the 31st Baileys Harbor Brown Trout Tournament April 25-28. A lot can happen between now and then, of course, but the recent thaw did at least open some lakeside launches and fill rivers and creeks with melted snow, luring a fresh run of rainbow trout. Egg sacs drifted in the deeper pools are popular for spawn-minded trout in the tributaries, while stickbaits and spoons trolled or cast in the lakeshore shallows tempt hungry brown or lake trout. Some anglers are getting boats or waders out while others still haven’t put away the auger. Bay ice has deteriorated, but there’s been walk-out action for walleyes, whitefish and pike in many areas. As always, stay off the ice unless you are keenly aware of local conditions and are following all safety protocol. Bass, perch and muskellunge seasons are closed on the bay, and the walleye daily bag limit is down to one until early May. Also, many Green Bay creeks and ditches are off limits right now to protect spawning pike and walleyes. Finally, don’t forget that current fishing licenses expire March 31. Starting April 1, you’ll need the 2019-20 version. The annual spring fish and wildlife public hearings and Wisconsin Conservation Congress county meetings will be held on April 8, 7 pm, at the Kewaunee and Sturgeon Bay high schools. New for 2019, there’s an online option to voice your opinion on the 80-plus questions. It’ll be open to the public for 72 hours starting at 7 pm that night at dnr.wi.gov/About/WCC/springhearing.html. Individuals will be required to sign in to use the online version. Systems are in place to identify people who try to provide their input multiple times. Those who attend in person will be able to run for or vote on local Conservation Congress delegates and alternates and propose or vote on citizen resolutions. If you want your opinion to matter in the county where you reside, you’ll need to stop at the local hearing to get an assigned number; you can then use that for your online option anytime during the next three days. All of the votes are advisory only and don’t necessarily lead to rule changes. Hunters gobbled up all the leftover fourth- and fifth-period spring wild-turkey tags in Zone 2, but thousands remain for the sixth week. In mere minutes, Z-2 hunters bought all 1,035 fourth-week tags when sales began at 10 am March 19. A sizeable chunk of the 7,541 that were available in the fifth week were also purchased. Remaining leftovers went on sale March 23, and the fifth week sold out, along with more than 3,000 of the 8,008 sixth-period tags. The regular spring wild-turkey hunt’s first period begins April 17, but there’s a youth hunting weekend April 13-14 and a number of Learn to Hunt outings earlier in April. This is the 13th year of the youth hunt, which was set up to give younger hunters an opportunity to gain valuable experience without competing with adult hunters. Kids ages 15 and younger may participate, but they must have a valid turkey-hunting license, stamp privilege and spring permit. If youths bag a turkey during the special weekend, they forfeit their regular tag. If they don’t shoot a bird, they can hunt later, during the time period for which they have tags. Calling the population of gray wolves stable and healthy throughout its current range, the U.S. Fish and Wildlife Service is proposing to delist wolves from Endangered Species Act protections. David Bernhardt, the acting secretary of the U.S. Department of the Interior, said the gray-wolf population stands at more than 6,000, far exceeding the combined recovery goals for the Northern Rocky Mountains and Western Great Lakes populations. Public comments on returning wolf management to the states will be accepted until May 14. Learn more at fws.gov/home/wolfrecovery/. All comments will be posted online at regulations.gov. Sandhill cranes, robins, red-winged blackbirds and many other spring migrants have arrived. Report your sightings of the usual – and any unusual – migrants at ebird.org/wi/home. Lake Michigan last week was six inches higher than it was a year earlier and 23 inches higher than the 100-year average. Water levels were 52 inches above the all-time low, set in 1964, and nine inches below the all-time high, set in 1986.